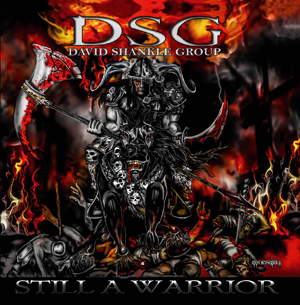 Known for being a member of MANOWAR between 1988 and 1994, DAVID SHANKLE remains a world renowned super shred guitarist and instructor for all true metal fans - as heard by the upcoming third full-length offering by his band, DSG, titled Still A Warrior. To be released on April 24th in Germany and April 28th worldwide via Pure Steel Records, the ten-track album is sure to please long-time fans of the fleet-fingered talents of Shankle. "I'm very happy to say that I feel this is the best DSG record to date," says Shankle. "I also feel this is the best DSG band out of all three of them so far. I'm very proud of everyone of these guys great job they did on the record." Joining Shankle in DSG are vocalist Warren Halvarson, bassist Mike Streicher and drummer Gabriel Anthony. "With new singer Warren Halvarson, new bass player Mike Streicher, and our new drummer Gabriel Anthony, this is by far the BEST line up to date." For 13 years, Shankle has been enjoying a solo career, as evidenced by the two albums, Ashes To Ashes (2003) and Hellborn (2007). And Still A Warrior does not disappoint, as it features both metallic anthems (the title track) and instrumentals ("The Hitman") with such guest artists as Michael Angelo Batio, Joe Stump and Parker Lundgren from QUEENSRYCHE. Also, the "Demonic Solo” (from the movie Jezebeth) is being hailed as one of the fastest guitar solos in the world. Shankle: "I think the new DSG record, Still A Warrior, is a combination of the best from the Ashes To Ashes and Hellborn CD's. A lot of great melodic vocals and full neo-classical shred guitar in your face.” Still A Warrior confirms: friends of US metal with a classical shred guitar influences will completely be satisfied by their old hero again! "Suffer In Silence (Agenda 21)"